My enjoyable stay at world class Movenpick Resorts and Spa was an exciting 3- day- prequel to a quiet, solemn Holy week that I intended to spend with my parents in Manila. Last year, I received a phone call from good friend Manny Osmena, a man I admire not only for his successful foray in the competitive world of high-end wines (among his other business endeavors ) but most notably for his deep Christian principles and spirituality. He walks his talk and one instantly gets this vibe during a first time meeting with the man. This call was all about his plans to renovate his hotel, formerly, the Hilton Resort and Spa in Mactan. The planned renovation would turn his resort into a world class resort to reckon with. his award winning wines in his private wine cellar. 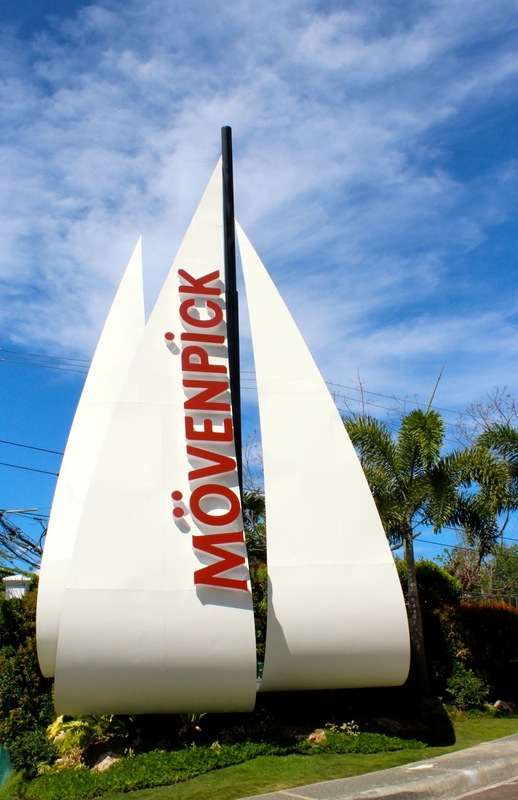 True to his word, Movenpick Resort and Spa in Mactan is out to outdo many other resorts in the world. With his hardworking team of experts, (notably GM Knuth Kiefer & F&B Director, Daniel Trumpfheller, Fatima Catindig, Resident Manager, ) Osmena stands at the helm of his empire and is steering Movenpick to meet 5- Star expectations. The red carpet hospitality was felt the minute my companions and I stepped out of the airport. A Porsche Cayenne collected us to bring us to Movenpick which was only a fifteen minute ride away. 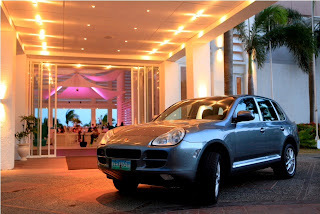 sent to transport us to Movenpick Resort & Spa and back. The entrance to the Resort is marked by their gigantic logo . The lobby took my breath away. The pristine white interior was easy on the eyes. It was along modern and minimalistic lines, without seeming sparse. Dashes of turquoise and yellow colors on chairs and pillows brighten the place. Resident Manager Fatima Catindig and her staff welcomed us with fresh cold towels and fruit juices. We were escorted to our plush modern suite and after we settled in, we rushed down to the Ibiza Beach Club for a Mediterranean dinner and to catch the Earth Hour program. with a view of the hotel and the Movenpick Residences. Some units with sea views are still available. The succeeding two days were spent in utmost relaxation. We needed this break to de-stress from our exacting jobs and hectic schedule in Manila. A well deserved massage at the Spa del Mar was a real treat! effective moves to stretch my aching back. brought us to the Sto. Nino Church in Mactan. The highlight of our stay was the Churrascos dinner Manny O hosted for us and some of our mutual friends from Cebu at the Ibiza Beach Club. The different dishes were paired off with his multi awarded Manny O Wines. parcel of a Churrascos dinner. and asked to pose with her. A million thanks to Manny Osmena for his over- the -top hospitality and showing us why Movenpick is at par with the world's best Resorts and Spas. A big Thank you to Ryan Jago for his photographs!